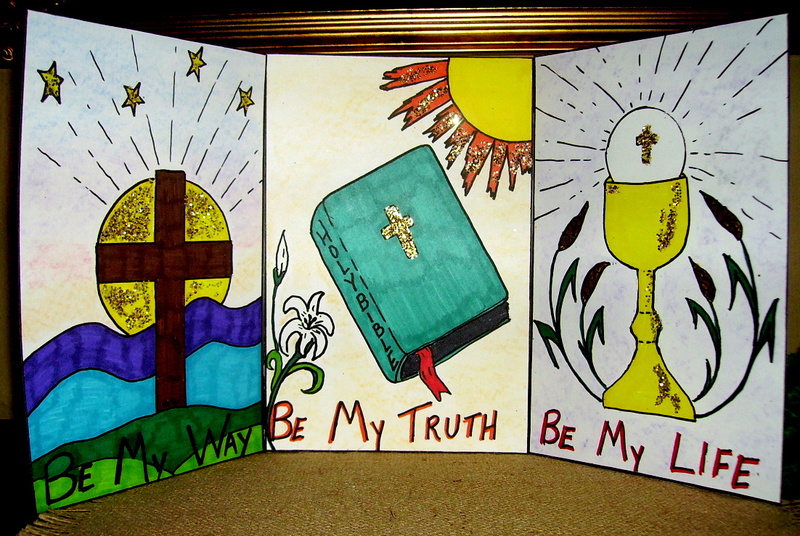 “Be My Way, Be My Truth, Be My Life, Oh Lord.” A beautiful hymn is the inspiration for this First Communion triptych. Made while preparing for first reconciliation and communion, this project will have special meaning for the class. This will make a nice table decoration for the First Communicant’s special day. Directions for this project, “Be My Way Triptych,” is in the 2nd Grade Projects Gallery in the sidebar. This entry was posted in 2nd Grade, Categories and tagged 2nd Grade, art and crafts for kids, be my way triptych, first communion, first communion art project, first communion triptych art, first reconciliation, triptych. Bookmark the permalink.